Welcome at my "Sonix USB PC Camera" web page. May be freely used and exchanged, as long as it is not modified. You may use this product solely at your own risk. I cannot be held responsible for any damages occurring due to your using this product. You may not lease, rent or sell this product to any other party. Have fun. Description - Shows the image seen by the Sonix USB PC Camera in 320x240 or 640x480 format using automatic exposure. It is also possible to show the built in test image. Image data may be transferred compressed or in pure bayer format. You may take 640x480 snapshots. These snapshots are written to the USBCAM.BMP and USBCAM.JPG files and rexx is started with the USBCAM.CMD file for post processing. You may replace USBCAM.CMD with your own version. Installation - Move the USBCAM10.ZIP file into a directory of your choice and unzip it. Copy the USBECD.SYS file to your C:\OS2\BOOT directory. Add this device driver to your CONFIG.SYS file with the DEVICE=C:\OS2\BOOT\USBECD.SYS /D:0C45:602D:0101 /N:SNX$ /V statement and restart your system. Obtain this product here free of charge. Click here for my home page. 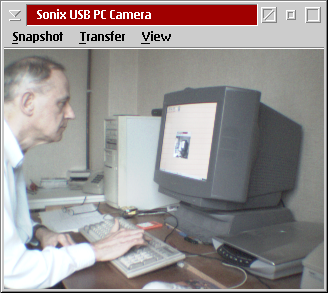 Attach the Sonix USB PC Camera and after the beep start the USBCAM.EXE program. Click on "Snapshot" to take a picture. Use the "Transfer" pull-down menu to switch between "Compressed" and "Pure Bayer" data transfers. Use the "View" pull-down menu to switch between "Sensor Image" and "Test Image" display. Use the maximize button to switch between 320x240 and 640x480 display modes. Any string returned by USBCAM.CMD will be shown in a dialog window. The FAILURE condition indicates that GBMSIZE.EXE could not be found. Obtain GBM Tools here free of charge. 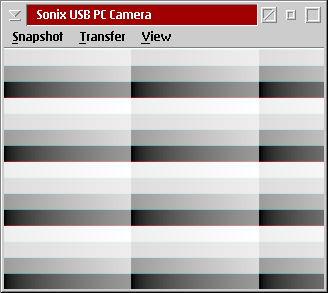 The Sonix USB PC Camera contains an SN9C102 bridge and an HV7131R sensor chip and has 0C45:602D:0101 as idVendor:idProduct:bcdDevice. I got this camera as a birthday present in 2005. I don't know if and where that camera is for sale today. © W.M.Brul 2005-2009, all rights reserved.